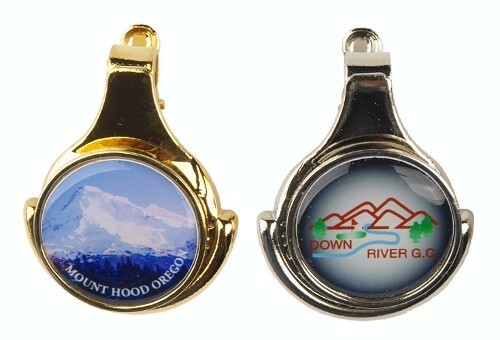 Quick release magnetic 1.00" ball marker with an easy clip-on feature for hat, visor, lapel or pocket. Your full-color logo reproduction or satin etch design on our removable ball marker has a durable epoxy finish to complete this handy golf accessory. Polished gold or silver finish. Frosted etch - add $ .50 per piece. 1.25" x 1.5" x .5"
• Color Polished Gold or Silver. • Production time: 2 weeks. Allow 3 to 4 weeks on Satin Etched Imprints. • Normal Packaging: Poly Bagged.